Can you imagine an America without a strong middle class? If you can, would it still be America as we know it? Today, one in five Americans is unemployed, underemployed or just plain out of work. One in nine families can't make the minimum payment on their credit cards. One in eight mortgages is in default or foreclosure. One in eight Americans is on food stamps. More than 120,000 families are filing for bankruptcy every month. The economic crisis has wiped more than $5 trillion from pensions and savings, has left family balance sheets upside down, and threatens to put ten million homeowners out on the street. Families have survived the ups and downs of economic booms and busts for a long time, but the fall-behind during the busts has gotten worse while the surge-ahead during the booms has stalled out. 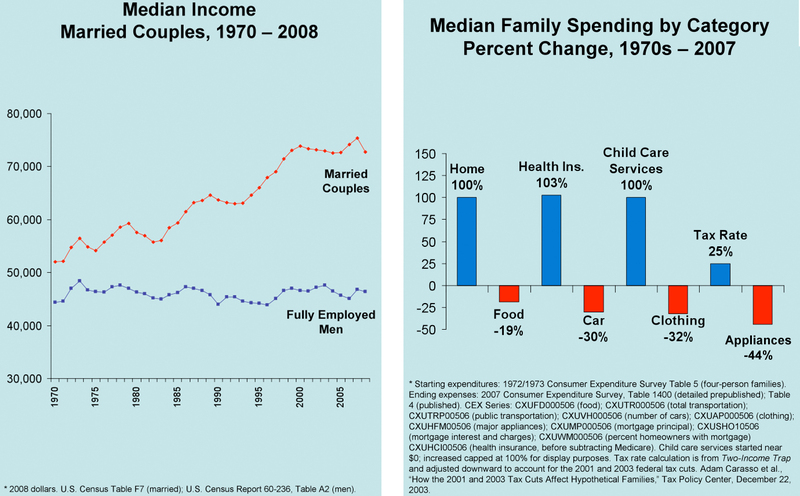 In the boom of the 1960s, for example, median family income jumped by 33% (adjusted for inflation). 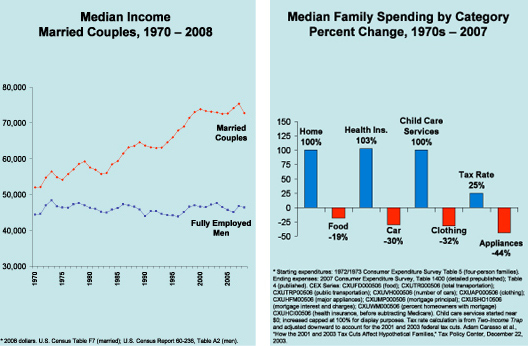 But the boom of the 2000s resulted in an almost-imperceptible 1.6% increase for the typical family. While Wall Street executives and others who owned lots of stock celebrated how good the recovery was for them, middle class families were left empty-handed. 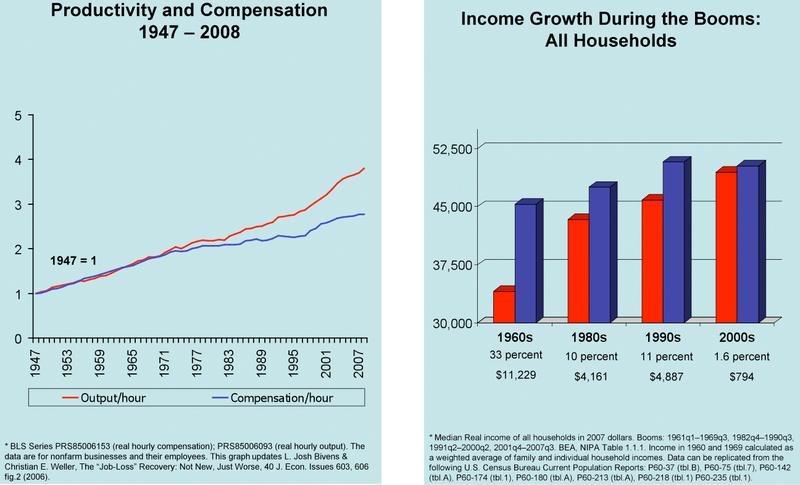 The crisis facing the middle class started more than a generation ago. 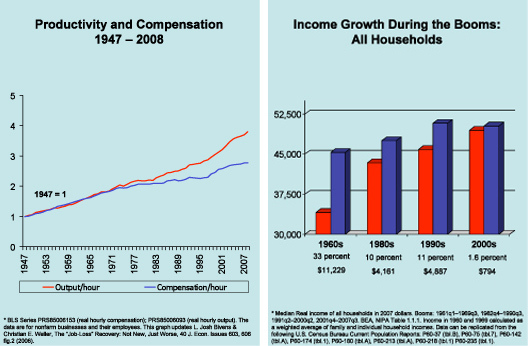 Even as productivity rose, the wages of the average fully-employed male have been flat since the 1970s. But core expenses kept going up. By the early 2000s, families were spending twice as much (adjusted for inflation) on mortgages than they did a generation ago -- for a house that was, on average, only ten percent bigger and 25 years older. They also had to pay twice as much to hang on to their health insurance. To cope, millions of families put a second parent into the workforce. But higher housing and medical costs combined with new expenses for child care, the costs of a second car to get to work and higher taxes combined to squeeze families even harder. Even with two incomes, they tightened their belts. Families today spend less than they did a generation ago on food, clothing, furniture, appliances, and other flexible purchases -- but it hasn't been enough to save them. Today's families have spent all their income, have spent all their savings, and have gone into debt to pay for college, to cover serious medical problems, and just to stay afloat a little while longer. Through it all, families never asked for a handout from anyone, especially Washington. They were left to go on their own, working harder, squeezing nickels, and taking care of themselves. But their economic boats have been taking on water for years, and now the crisis has swamped millions of middle class families. The contrast with the big banks could not be sharper. While the middle class has been caught in an economic vise, the financial industry that was supposed to serve them has prospered at their expense. Consumer banking -- selling debt to middle class families -- has been a gold mine. Boring banking has given way to creative banking, and the industry has generated tens of billions of dollars annually in fees made possible by deceptive and dangerous terms buried in the fine print of opaque, incomprehensible, and largely unregulated contracts. And when various forms of this creative banking triggered economic crisis, the banks went to Washington for a handout. All the while, top executives kept their jobs and retained their bonuses. Even though the tax dollars that supported the bailout came largely from middle class families -- from people already working hard to make ends meet -- the beneficiaries of those tax dollars are now lobbying Congress to preserve the rules that had let those huge banks feast off the middle class. Pundits talk about "populist rage" as a way to trivialize the anger and fear coursing through the middle class. But they have it wrong. Families understand with crystalline clarity that the rules they have played by are not the same rules that govern Wall Street. They understand that no American family is "too big to fail." They recognize that business models have shifted and that big banks are pulling out all the stops to squeeze families and boost revenues. They understand that their economic security is under assault and that leaving consumer debt effectively unregulated does not work. Families are ready for change. According to polls, large majorities of Americans have welcomed the Obama Administration's proposal for a new Consumer Financial Protection Agency (CFPA). The CFPA would be answerable to consumers -- not to banks and not to Wall Street. The agency would have the power to end tricks-and-traps pricing and to start leveling the playing field so that consumers have the tools they need to compare prices and manage their money. The response of the big banks has been to swing into action against the Agency, fighting with all their lobbying might to keep business-as-usual. They are pulling out all the stops to kill the agency before it is born. And if those practices crush millions more families, who cares -- so long as the profits stay high and the bonuses keep coming. America without a strong middle class? Unthinkable, but the once-solid foundation is shaking. Elizabeth Warren is the Leo Gottlieb Professor of Law at Harvard and is currently the Chair of the Congressional Oversight Panel.